Looking for a wintry theme project to spruce up that area left barren from your holiday décor? 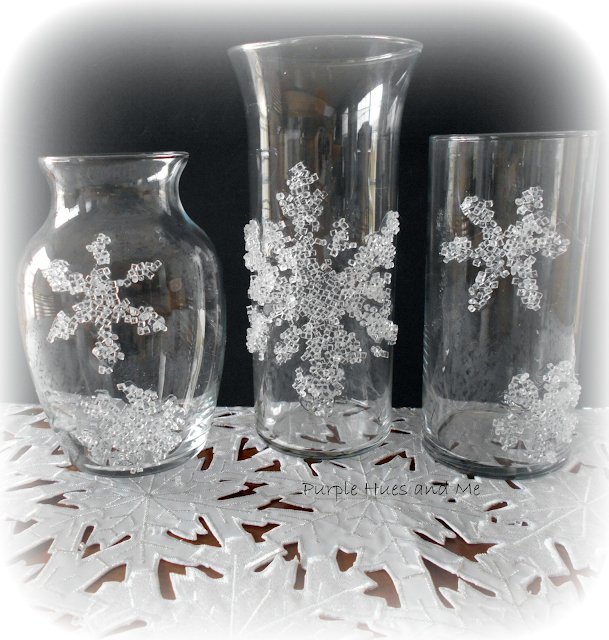 Why not make your own beautiful snowflake table accents using decorative fillers on inexpensive glass containers from the dollar store! And if you look closely at the fillers - they look like tiny crystal ice cubes - imagine that! Cut out snowflake patterns . . .
and tape on glass using painter's tape. Sprinkle filler over glue using spoon. Press down to adhere filler to glue. Pull stencil off while glue is still wet. Clean glue and filler off of stencil using acetone and wash with soap and water. Allow filler and glue to dry overnight. This dimensional technique of adding decorative fillers to glue designs looks elegant, goes with most decors, is budget friendly and can be used all winter long! And for a warm glowing effect, battery candle votives can be added. Happy new year, Gail! Love these snowflake vases. What a great idea! As usual your creativity is always a surprise! Great idea- perhaps something like this for Valentine's Day too! Whoa! I love your snowflake vases but would have never thought of using the glue to make them! Thanks so much for sharing your creativity at the The DIY Collective this week! Please come back next week to show off your latest project! Love your project Gail!! Happy New Year. Looking forward to all of your wonderful creations in 2016! Thanks, Ana! Have a happy, crafty 2016 year, too! Great idea and the vases are beautiful! I have just one question for you. What is Decorative Filler and where do you buy it? I would love to try this out and I have everything but the Decorative Filler to get started on this project. Thanks, patfair! Decorative fillers are usually used in glass containers or vases to enhance the appearance of arrangements. They come in a variety of colors in crushed or ground glass, mirrors, stones, gems or crystals, etc. And are usually found in the floral section of craft stores. totally cool! love these snowflakes on glass! Such a great idea and would be fun to try for different seasons or holidays! Very pretty, and I love how easy it is! Wow! Those glasses are so pretty with the snowflakes. Thank you for sharing. Hi Gail, I'm visiting from Roses of Inspiration. I just love these, very pretty and so simple. Wow these are beautiful. Love them. You make the prettiest crafts and you are so creative. I love your decorated vases. Thank you for sharing with Roses of Inspiration. It's so good to have you at the party. Hugs! Your project is so clever and pretty. Enjoy the light on the long nights of January. Gail, love your design, so creative and fun! I would have never thought to do this!